I waited so long to do this part of the story. And one different thing is that everyone else who plays a vampire didn’t get to play their human selves before they changed. Yet that has everything to do with who you are as a vampire. All of the good qualities about you and all of the things that make you special and interesting as a human are just amplified. Even though she totally matures and because you’ve seen her be young at a normal stage of progression, suddenly she’s really realized herself and she’s this fantastic amazing version of the girl that you know. 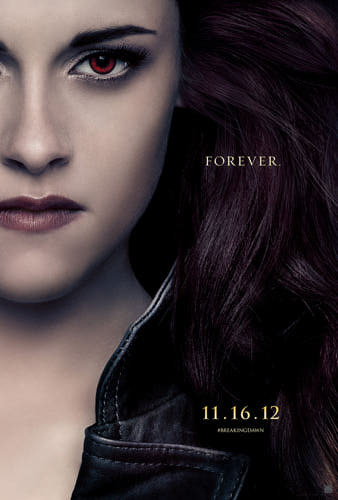 How does Bella deal with her newfound vampire powers? She is like a baby. She doesn’t know how to use the tools that she’s been given. She is a bit like a 10-year-old getting into a sports car, like a six-speed sports car. And going ‘Whoa, I really don’t know how to drive this thing.’ She’s actually pretty good at it, and it was fun. It was fun breaking her in and running and not having to play fear, and really just going in and like taking charge. So far you haven’t done as much physical work on screen as the other actors. How did that feel? Yeah. The wires. Sometimes, you want to get as close as you can to those experiences. Like I want to feel that strong, but obviously, you can’t always. Sometimes you have to fake certain things. I really appreciated it when we weren’t on treadmills. l liked being able to actually run on the ground and get movement, actual space behind me, and there were different ways that we accomplished looking strong and fast and all that stuff. My favourite bits were always the ones that we could actually do. Did you have any fear? No! (laughs) I must say, some people really know how to use themselves like an instrument. They have got a lot of self-control, and then after that, they can really take credit for what they’ve done. I’m always like, ‘What just happened?’ and my nerves are really good for me. They push me really hard and if you watch someone get a little bit nervous and get launched off, it’s much more interesting than watching someone who is completely comfortable. Fear is good. You need to be comfortable being fearful. And I know it doesn’t really go together, but it’s giving yourself to it, and if you do everything very honestly, mistakes are great. Often that’s when the most interesting things happen. Do you think that attitude towards fear applies in life as well, or are you talking just about acting? That’s a very blurred line. There’s really never a time when I am not working, when I am not actually working on a movie. It’s not like you stop asking questions. There aren’t many answers, but there is that striving to figure it out and I’m always wondering how to turn something into something. I’m always taking from experience. And it sounds nuts too, but I’m always after the fact. Maybe I’m like a weirdo or a crazy person, but I go like, ‘Oh, hmmm, that just stuck, and now I’m going to be able to take that and put it over there.’ Work doesn’t really stop. What is it about Bella that you will miss the most? I hold her. It’s not like I have to miss her. It’s not like I feel I could go back and do more for her or take more from her. I’ve taken everything, and as much as she doesn’t weigh on me anymore, which is great, it feels really good to not have any responsibility to her anymore. Now it’s good because I have a lot of room — it’s not going to fill up any time soon and it’s a case of that I feel really close to every character I play. If you told me that I need to do re-shoots for any movie on my résumé, I’d be like ‘Okay, that would be something that I could do.’ Even if you went years back. 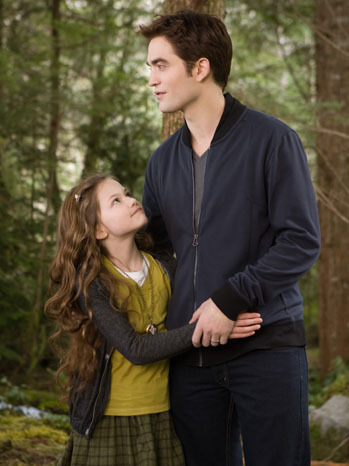 When you go home are you still like Bella today? Do you just store her in your database? You don’t let it torture you afterwards? Sometimes it just happens. Sometimes you go home and you are like, ‘Grrr, I want to go back to work now! Like who wants to go to sleep right now?’ They break for lunch and you are like, ‘Oh yeah, let’s just all go and sit down!’ It doesn’t make much sense. In your profession, because you play different people, is it possible to lose a sense of who you are? Well, for me, it doesn’t make any sense to say that I can change who I am or become a different person. I think that there are stories that I’ve read that pull things out of me that I am shocked by, and I want to explore, and so doing any movie is figuring out why something sparks something in you that is unexpected. And yeah, I’m not a character actor. I think there are qualities that are really buried there, in certain stories, which make you suddenly aware of things. And finding out why is why I like to do it. Do you feel as though the Twilight movies will cast a long shadow over your career? People will always talk about the fact that I got really super duper famous on Twilight. If people that really love the books have a hard time seeing me in other parts, it’s kind of the ultimate compliment! But I’m sure that there are not too many people like that, or maybe not for me, and it hasn’t seemed to put a damper on anything that has anything to do with my personal experiences. I am so challenged; I’ve gotten myself into a position where I get to pick and choose my challenges, which is close to unparalleled. It’s very lucky and unique. It doesn’t happen as an actor very often and if I didn’t have that, then I would be pissed off. If I didn’t have that, then I really would be worried. But Twilight, I’m really proud of it and hopefully people keep talking about it, you know? Do you consider Bella the vampire to be a role model to young girls? And if so, how? Generally, yeah, of course. I think that you have got someone who is doing something that just doesn’t fit into other people’s expectations and priorities, like she’s going against the grain and doing things that are seemingly to other people really reckless. And yet she is honest. She’s following her line, and I know there are a million criticisms to be thrown around about her — she relinquishes some sort of aspect of herself for a man — but I think it’s ridiculous. Theirs is such an equal relationship and it takes a really strong person to reach so high for something and realize that even if she doesn’t get it, it’s worth it. The fourth book exists, Breaking Dawn — Part Two exists, but even if it didn’t, I think she’s the type of person that would have done it anyway!